I don’t know anyone who doesn’t love pasta! My boys ask for it on a daily basis…so I try to make a different pasta every week to broaden their taste buds. This Spaghetti Bolognese is by far their favorite! And it will soon become your family’s favorite too. A classic Bolognese sauce simmers for hours on the stove to achieve the perfect balance of tender meat and flavor. This sauce is a really easy to make meat and blush-sauce and thankfully doesn’t take hours to make but the results taste like they have been simmering all day. In a large skillet, heat the olive oil; add the beef mix and cook until browned, seasoning with the salt and pepper. Add the red wine and sauté for one minute. Add the water and the garlic; simmer for a few minutes then add the jar of sauce. Stir the meat. Add the one cup of chicken stock to the empty jar of sauce, cover and shake; then add the broth to the skillet. Bring to a boil; reduce heat and simmer at least 10 minutes. In the meantime, bring a large pot of salted water to a boil; add the pasta and cook as directed. A few minutes before serving add the heavy cream. Stir gently; adding the Parmesan cheese. Heat through and serve over the cooked pasta. Top with more Parmesan cheese. This recipe has been shared at Senior Salon, Throwback Thursday, Fiesta Friday, Funtastic Friday, Foodie FriDIY and Saucy Saturdays…go check it out and then go visit some other great sites! < Pasta Made with Love! Mmmmm!!! Love a great sauce! Stopping by to do some sharing from #FoodieFridIY! I love, love bolognese. This looks absolutely perfect! This looks heavenly! 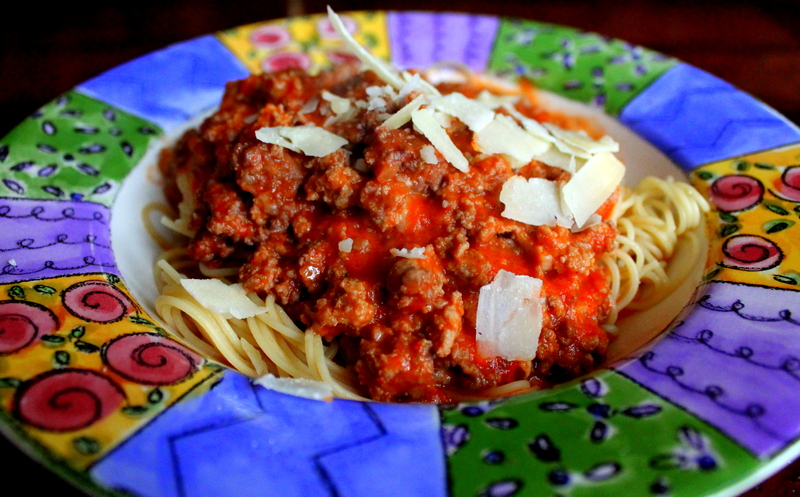 I love bolognese, and I’d love to try your recipe. Thanks for sharing at Funtastic Friday. Thanks! And since I’m married to a Latin man I’ve learned to love rice…and I’ve learned to make so many different kinds too (cilantro, Spanish, coconut, etc) We LOVE rice! !